Will and I will be manning our Seed Treasures booth, showing some of the various crops we grow and answering questions as we pass out catalogs on august 20th and 21st. I’ll also have some of my books available for those who wish to purchase autographed copies. I’ll be speaking on gardening at 2 PM on Saturday and speaking about canning at 4 PM on Sunday. We’re expecting a great show as there are many workshops as well as vendors. The Orr Center is housed in the old school in Orr Minnesota, about 40 miles straight north, up Hwy 53, from Virginia, Minnesota. Check out the Orr Center’s website for more information at www.orrcenter.com. I hope to visit with you there! 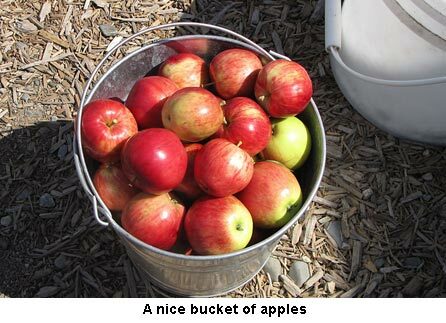 Yesterday I picked a bucket of Norland apples to can up. They were starting to fall off the tree they were so ripe. Norland is a very productive fall apple. It’s tasty, early to produce and very hardy, but it doesn’t keep. So after giving my friend a pail full, I picked one for us and canned ’em up. I did keep out enough for a pie, of course. I wasn’t so sure how it’d work as it is a soft apple and might not make a nice pie. I was wrong! Although it was soft, it more than made up for it by being very tasty. We were so glad to have met you too! It’s exciting to hear you’re on the path and loving the good life. You, too, will inspire others and those ripples will pass on and on. It was a pleasure meeting you & attending your speaking on canning. I have read & follwed your journey for the past ten years. You have truly inspired me to “live the good life”. I am grateful to learn from your experiences since I am the first generation in my family to strive for a self reliant lifestyle. I’d certainly give Hopi Pale Greys another try. So many different people in a huge array of climates have all raved about this squash I just can’t believe it won’t grow in your area. Try, try, try again. It’s well worth it. We’re really lucky here; we live so far in the woods the “normal” apple pests haven’t yet found our trees. Thank God! 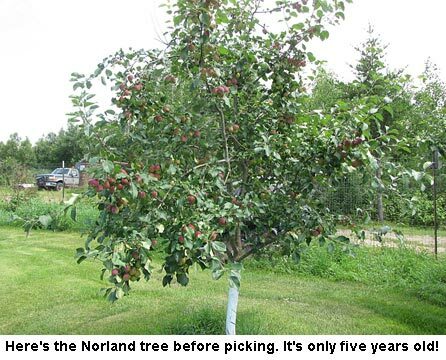 Our trees are all standard size as semi-dwarf and dwarf rootstock is not hardy here in northern Minnesota. It is grafted, as are most of our trees. It came from Fedco Trees. 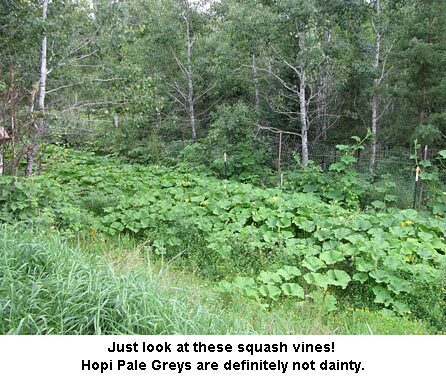 Wow, not being able to grow Hopi Pale Greys? That’s so sad. It may be the raccoons. They sometimes eat even the little bulb at the base of the squash flowers! I’ve had good luck using a multi-strand electric fence to keep ’em out of the garden. Cute critters but oh how damaging! Don’t see any insect damage on those apples – how did they escape codling moth and apple maggot? That’s an amazing tree. I have never had that much production from a 5 year old tree. Is it grafted or standard size, and where did it come from? Hopi Pale Grey doesn’t grow well where I live, must be one of the few places in the world where that is true. Thankfully I only planted one Hopi Pale Grey. It’s a riot – has overflowed the raised bed it’s in and spreading to the area around it. I’ve had a hard time with the raccoons as they’ve destroyed what few squash that have set on. I have one left that I’m guarding with my life. I read they hate ammonia so I have a dish of ammonia on either side of the squash and so far, so good. I wonder if only having a single plant is why so few squash have been produced?